Non-Surgical hair replacement can be a wonderful option for those who suffer from significant hair loss and would like to regain the appearance of having a full head of hair without surgery. While there are some incredibly natural hairpieces being made today, most hair loss consumers have no clue what to look for when purchasing a hair piece. Whether you want thick flowing curls, an elegant undo, or something sassy, hair replacement restores your hair quickly and discreetly. Kathy matches real human hair with your own to create a stylish design that looks and feels like the real thing…..because it is. You can brush it, style it, curl it,swim and yes let the wind blow through it. Get the look you’ve always wanted. 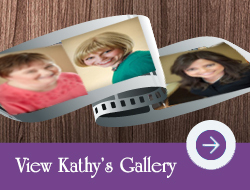 Kathy will work with you to create a flattering, natural look that fits your personal style. Restore your hair to its former look, or experiment with new styles to enhance your look and increase your confidence. Take back your life, take back your confidence, and take back your self esteem. Help is just a phone call away!